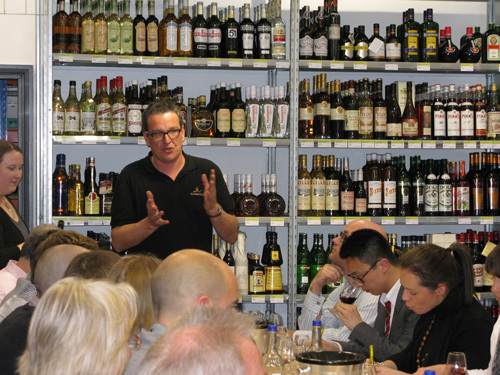 On a cosy warm Wednesday evening, we here at Amathus Drinks Soho were delighted to welcome our good friend Andy Cook from Tramontane wines for a truly exceptional master class. With a packed out house, Andy was ready to showcase a range of his wines accompanied by a small variety of nibbles that are traditionally associated from the South of France. Tramontane was first established in 2008 as a jointly run project between Andy and Phillippe Gard. Between them, they have worked as far away as New Zealand and some of the finest Chateaux in Bordeaux. The main philosophy behind Tramontane is to produce top quality wines from the heart of Roussillon. With the hot days and fantastic sunshine that engulfs the South of France; it is not surprising what attracted the two to establish roots in Roussillon. The wines are becoming internationally recognised and are now consumed all over Europe, from as far as Switzerland, Germany and of course here in the UK with Amathus Drinks. Tramontane produces wines that are traditional to the region, including reds from Grenache, Syrah Mourvedre and whites from Macabeu (that’s Viura in Spain). The south of France shares some of same wine growing traditions as Spain through Catalonia that spreads as far south as Barcelona. Andy was a very welcoming host who has captured the heart and soul of the Roussillon region with his wines. I can wait to buy another bottle! A rich floral nose that delivers a lemon punch. Fantastic mierality on the palette with rich flavours of apples that finishes with a clean crisp finish. No oak aging. A sumptuous wine that would match beautifully with a meaty fish or chicken. Stunning notes of peach and apricots on the nose that tantalises your mouth. Stunning flavours of stone fruit, in particular white peach with sumptuous background notes of vanilla. This wine definitely potential to age for a couple of years! Inviting notes of red fruits, with dried raspberries and blackberries on the nose. Supple tannins that open up into flavours of spice, a hint of vanilla and a supple acidity that is screaming out for fatty sausages or steak. Heavily based on Shiraz with a supple blend of Grenache to give the wine an red fruit driven nose. On the palette, spicy dark plums with aromatic strawberries. The bold tannins in this wine is a fantastic match for steak or stew dishes! A sumptuous blend of that famous Southern French grape Mourvedre, rounded off with Grenache. No oak was used during fermentation giving this wine clean, bright acidity. On the palette, spicy dark fruits that develop into hints of leather and tobacco.